A crime caper, set amongst the racial tensions of 1950s suburban America, this earnest satire is fun, but ultimately feels a bit thin and fails to give any weight to the politics it hints at. 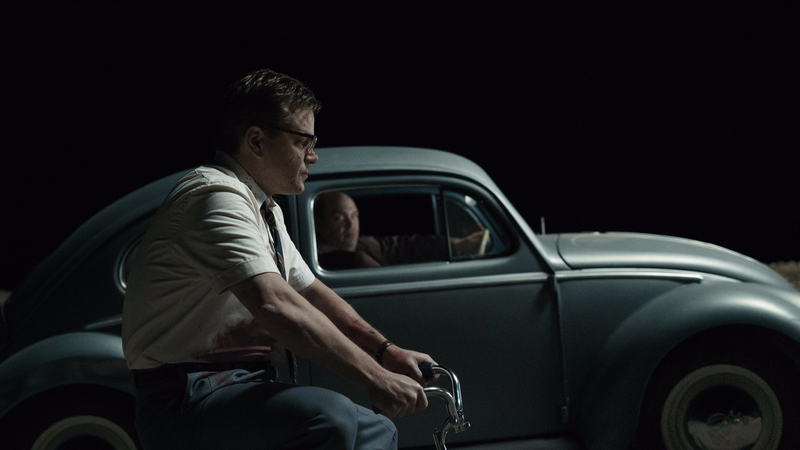 With a script originally written by the Coen brothers back in the 1980s, and adapted further by George Clooney (who also directs) and co-writer Grant Heslov, Suburbicon harks back to earlier Coen works like Fargo, where hapless and unlikeable characters make really bad decisions within a dark, slapstick, heist-gone-wrong narrative. Suburbicon is a lily-white American suburb in 1959, where the residents are as white as their picket fences, and everyone knows their neighbours. Gardner Lodge (Matt Damon) is the archetypal white-collar patriarch of a 1950s suburban nuclear family. His wife, Rose (Julianne Moore), is the apron-donning, cookie-baking, doting housewife, and together with their smart son Nicky (Noah Jupe, who is a star in the making, and absolutely superb), and Rose’s twin sister Margaret (also played by Moore), their suburban life seems unremarkable. However, the Lodge household seem suspiciously unlucky: Rose is wheelchair-bound after a car accident – Gardner was behind the wheel of the car causing her injuries – and the whole family become embroiled in a house break-in which proves fatal. Lies, betrayal, deceit and violence must all be navigated in the pursuit of truth, and the only person with any moral substance appears to be Nicky, an unwitting witness to terrible behaviour by the most flawed of people: his own family. Alongside the Lodge family is another storyline, based on the real life events of what happened after an African American family moved into white suburbia in the 1950s and suffered huge prejudice. When William and Daisy Meyers moved to Levittown, in Pennsylvania, 500 of their white neighbours ended up on their lawn shouting racist slurs, hanging Confederate flags, and burning a cross on the lawn next door, and their lives were made a misery. In Suburbicon, Mrs Meyers (Karimah Westbrook) and Mr Meyers (Leith Burke) are the Lodge’s new neighbours, and suffer the same fate as their real-life counterparts, but aside from brief baseball playing between their sons, the two families have few interactions with each other. The Meyers are, for most of the film, little more than a side story to the central white story, and even though Clooney attempts to juxtapose them both, there is little connection, and the white storyline gets the most attention. The murder-mystery-whodunnit white-people caper is the central focus, and the black characters are barely characters at all. It’s a shame that a movie featuring the first black family to move into a white neighbourhood turns into just a supporting story for the white narrative; it’s ironic that in a film trying to deliver a message about racial integration, Clooney ends up silencing its black characters, allowing them to be little more than a plot point. The Lodge storyline has its enjoyable moments, particularly Moore’s double playing of twin sisters – and the betrayal within their own relationship – and Oscar Isaac is excellent as a fearless insurance investigator who manages to ruffle Gardner and expose the lies in the household, and it would have been great if he’d had more screen time. But even though the narrative includes death and blackmail and double-crossing, the slow-plodding story only allows for the Lodge storyline to shine, and it does so, dimly, in subdued monochrome colours. As a dark comedy about white suburbia, there are some funny moments, but these are brief and too sporadic, and by trying to attempt to make social commentary about racism, and failing, Suburbicon is little more than a worthy failure.